The Screenotex company established in the year 1993 by passionate and inventive owner of this firm with inspiration to offer new and pioneering machines in the field of Textile and Printing. Backed with proficiency and knowledge providing new range of latest Machine. As our country is agriculture based so textile printing and its interrelated industry are covering most of the market demands. As lifestyle of people changes day by day Screenotex bring forth for easy to handle, low maintenance Textile Printing Machine considering the market requirement and trends. This Textile Printing Machine fulfills all industry level requirement and functions smoothly for huge production.The history of fabric making in India is as old as the Indian civilization itself. Textile machinery manufacture falls to a much anon age the age of industrialization.Our provided Textile Printing Machine is available in the market considering the daily usage and frequent use at industrial, and for printing purpose. Our firm is perfect with well engineered setup with team of workers, labours and professionals. Since Two years the firm is in the service of the textile industry by supplying Textile Printing Machine and by providing finest Quality printing Machine with Advance Technology and superior quality material, which sets the industry standards. With this we have also supplied more than twelve hundred Flat Bed Printing Machine, Screen printing machine, spares, Accessories to foreign countries such as Africa, Indonesia, Quawait, Malaysia. We as Manufacturer, Supplier also providing different types of machines as Screen printing Machine, Flatbed Textile Printing Machine Manufacturer, Digital Textile Printing Machine, Automatic Textile Printing Machine, Manual Textile Printing Machine, Textile Processing Machines, Float Dryer Machine Manufacturer to our customers. Our skilled professionals and technicians work hard to make available you best quality of the Textile Printing machine. Our Designers create new designs and work on it with new, innovative idea using latest technology and effort for making best quality printing machine. Due to vast knowledge and experience in this field, we manufacture different types of printing machines as per current and future needs of the customers and industry by keeping in mind the rising demand of customers and as per patrons specification order, we engineer dynamic machine. Our engineers and skilled workers make exertion, for manufacturing of machine under the observation of experts. Textile Printing Head is developed bearing in mind the textile industry usage and demands with adjustable parts, changeable easily operable ink or printing color is easily filled. It is generally used in textile industry as a Textile Printing head appliance is with excellent designs and changeable parts. To meet the industry standards and norms we recommend it as per the requirement of client. Our technicians and specialist manufactured it using most selected material under administration of experts for immaculate performance printing heads are mostly demand by clients as its procedure increase in the market. 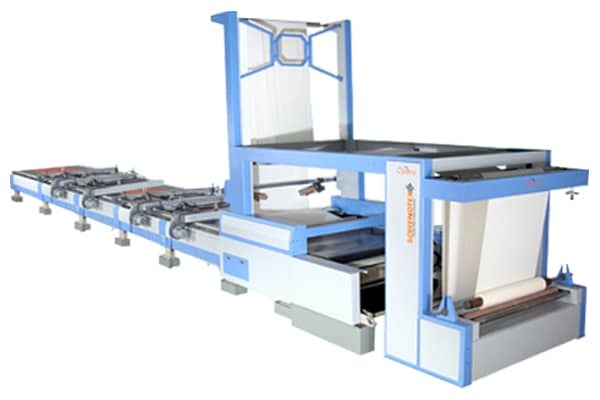 Screenotex Textile Printing Machine is Durable, High quality, Sturdy design for huge production of Fabric and also it is widely used in industry for different purposes such as Flexo printing, Fabric printing, Digital printing, Screen printing etc. As our various types of machine such as presenting to you an inclusive choice of products which include Printing Machine such as Dining Table Paper Printing Machine, Four Color Flexo Printing Machine, Single Color Flexo Printing Machine, Double Color Flexo Printing Machine, Multi Color Flexo Printing Machine and Textile Printing Machinery are of high competence, adamant design, less repairs, low cost. Textile industries use machines for Knitting, weaving, spinning, and manufacturing clothes also for a choice of other purposes. Our on hand range is in concurrence with set industry standards and is applauded for outstanding production features. Textile Machine is available in special technical specifications as per the detailed provided by the clients. Offered range is used with a allegiance to provide quality pre-owned, and refurbished textile machinery. These are also available to our clients in different condition as per their requirements and at aggressive price. The Textile Printing Machine is widely used in textile Industry and different other small firms where fabric printing is done. This uses different kinds of Textile printing machines as Digital, wallpaper, Mug Printing, Screen printing, Automatic Textile printing, Flatbed Textile printing etc for different purposes different printing machine is use. Screenotex Textile printing Machine is manufactured keeping in mind varied demands of the client we proudly announce ourselves as the leading name also engaged in offering Screen Stretching machine, Manual Printing machine , Textile Printing Machine, Screen Printing Machine, etc is used for various different purpose of printing as jute bags, t-shirts, sarees, dresses, jeans, digital printing , hoardings, boards, attractive packing printing, films of foods, mug printing , flexo printing of HDPE/PP woven sack, Corrugated sheets as well as laminated jute, paper bags etc .The offered printing machine is accessible in different specification to choose from. As this machines are very useful to business, factory for Textile, Fabric dyeing, as India is Agriculture based country where business related to Textile, Clothes, Printing, stationery etc is more so according to market trend ,obligation of client as per business. We provide machinery keeping in mind customer’s requirement. We provide machine that is excellent performance, sturdy design, low safeguarding cost exactly match your business needs. Our offered range of machine is concerned with apparel industry is concerned with design, this machine smoothly, colorful, easily print the fabric, with good texture, for huge production as raw material or fabric easily passed by the Textile printing machine, with less effort ,low preservation cost. WHY TEXTILE PRINTING MACHINE ? As India is developed and Agriculture based country, Textile Industry grow more in India. As Our Textile Printing Machine are further consistent, stretchy, low upholding, resourceful usage, at low price. Textile Printing Machine Or Printing Machine are now widely demanded by industry as this machine huge market is there today and in future also. Textile Machine is with special features outer body is manufacture from stainless steel, aluminum body free from rust, corrosion resistance. For maintenance the machine has spring system which can be adjusted for easy operation , functionality. This Machine is with well proofed spare parts, and flexible easy to move, activate Machine. As Raw-material used in manufacturing of various machine are qualitative and ISO certified for smooth functionality it is recurrently tested on various parameters of Quality by skilled professional. Exclusive design with both benefits of large production, exclusive design, modified form to fulfill all requirements of printing under one roof. As maker, Supplier we proffer our client diverse types of machines as per specific, various constraint of industries and customers. This various types of machine are widely applied in industry as food and packaging, Textile, Fabric, Stationery, Plastic, Glass ,cotton, yarn industries, Textile printing machinery etc .This is commonly used for well-organized, robust, long lasting and time saving . As compared to other machines it is highly cherished by customers due to it sturdy designs, economical price, high strength, high production capacity. Our Digital Textile Printing assortment of machine is manufactured using most selected quality material under the direction of adroit professional .The offered range of machine is available in an explicit format as per the precise requirement of clients. This is highly esteemed by customers from various small and large firms , industries, dye making factories as it gratify the sets industrial standards. our technicians and expert keeps watch or observation on manufacturing of this machine and after passing through various quality parameters for better functionality and smooth performance.